Yoga classes designed for insomniacs and those who want to improve sleep quality. If you’re not sleeping well, wake up in the middle of the night, can’t get to sleep or wake feeling exhausted you can re-train your body and brain to sleep better rest deeper and feel more alert all day using this program developed by leading expert and Life Centre teacher Lisa Sanfilippo. 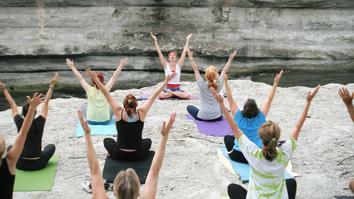 Yoga offers us healthier coping mechanisms and helps us to get 'underneath' recurring problems. Lisa explains how and why she developed her comprehensive system for better sleep. Lisa shows you a series of simple poses and breathing practices that optimize the waking up process, allowing you to begin your day feeling refreshed. The full sequence can be downloaded in PDF format from www.supersleepyoga.com. Good sleep begins with the habits that you practice during the day. Here, Lisa demonstrates a series of simple poses that can be done at your desk that gently revive you without the need for sugar or caffeine! The full sequence can be downloaded in PDF format from www.supersleepyoga.com. Lisa demonstrates the 3 part breath technique, a simple calming practice that can be used at bedtime to balance the nervous system, and any time of the day to soothe and de-stress. Lisa shows you a simple and effective sequence that will dissolve tension from the body and mind, allowing a restful night’s sleep. Ideal for both those who struggle to sleep and those who wish to achieve a deeper state of sleep. The full sequence can be downloaded in PDF format from www.supersleepyoga.com. To enjoy Super Sleep Yoga™ , you need to join Conscious Life. By registering for a 14-day free trial you will also have complete access to the entire platform via our website and mobile applications. After 14 days paid membership will begin and you can easily cancel at any time in “Welcome”.